Group Tours, rentals, (will deliver bikes) repairs. Suspension Mt. Bikes, Road Bikes, Electric Bikes, Hybrid Cross Trainers, Pedalina 4-wheel pedal carraige, Tandems, Children’s Bikes, Bike Trailers, Car Carriers, Free Helmet/Lock/Parking w/Rental. “Downhill Bicycle Tour” Sulphur Mountain Downhill Bicycle Tour – 2 person min/16+ person max. 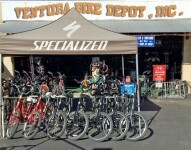 Includes specialized suspension mountain bike, transportation, guide and water bottle. Call 805-340-BIKE to RSVP.